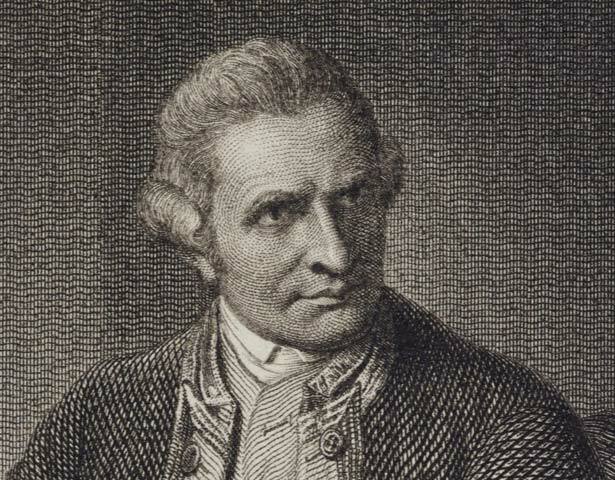 As captain on three voyages of discovery in the late eighteenth century, James Cook became the first European to define the outline of New Zealand. Thanks to Cook’s detailed charts, and his gentlemen passengers’ scientific and artistic documentation, accurate knowledge of New Zealand was available in Europe for the first time from the 1770s. James Cook was born in 1728 at Marton-in-Cleveland, Yorkshire, England. In 1746 he moved to the port of Whitby, where he was apprenticed to a shipowner and coal shipper. As a sailor in the North Sea coal trade the young Cook familiarised himself with the type of vessel which, years later, he would employ on his epic voyages of discovery. In 1755 Cook took the unusual step of volunteering for the navy as an able seaman. He served 10 years on the North American station, where he developed skills in marine surveying and navigation. In 1768 he was appointed to command a scientific expedition to the Pacific Ocean. His primary objective on this voyage was to observe the transit of Venus across the disc of the sun in Tahiti, while his secondary objective was to search for the fabled great southern continent. Instead of finding a great land mass to balance those of the northern hemisphere, Cook initiated the first Māori-European interaction since Abel Tasman’s brief encounter in 1642. In his remarkably accurate charting of New Zealand and his dealings with Māori, Cook displayed his excellence as a navigator and his essential humanity. Learning from his tragic experience of confused bloodshed after the first landfall in 1769 at present-day Gisborne, Cook evolved a policy of race relations aimed at facilitating surveying work and the resupply of his ships, while avoiding friction with Māori. This cooperation was necessary to sustain his crew on the three visits Cook made to New Zealand, in 1769-70, 1773 and 1777. James Cook has left a permanent imprint on the consciousness of New Zealanders. Districts, suburbs, schools, hotels, motels and consumer products bear his name and likeness. Of more enduring importance, he named more coastal landmarks than any other person, and his name is attached to two of the country’s most significant geographical features (Aoraki/Mt Cook and Cook Strait), as well as many minor ones. We have 5 events in history, 4 biographies, 2 articles, related to James Cook.